Jesse Owens, born James Cleveland Owens on September 12, 1912, in Oakville, Alabama, achieved greatness in track and field by setting a seemingly unbreakable world record in the long jump event. That record stood for 25 years. Owens also won four gold medals in the 1936 Olympic Games in Berlin, after which he attained mythic status for defeating Nazi leader Adolf Hitler’s idea of Aryan supremacy. When Owens was nine years old, his sharecropping family left Alabama for Cleveland, Ohio where “J. C.” soon became Jesse, and a star athlete. While working to pay his own way through school at The Ohio State University, Owens shattered world records in such events as the 220-yard dash, the 220-yard low hurdles and the long jump. But his Olympic performances in 1936 sealed his fate as an American legend when he jumped 26.4 feet and into the hearts of millions, something that had never been done before, let alone by an African American. For years, Owens either held alone or shared records held by members of the International Association of Athletics Federations. Once retired from competitive track, he became, among other things, an inspirational public speaker. In 1955, President Dwight Eisenhower named Owens an Ambassador of Sports, and he travelled the world promoting the virtues of amateur athletics. As a celebrated citizen, Owens provided support to youth service organizations worldwide and authored two autobiographical books. As a businessman, he worked as a dry cleaner and DJ, toured with the Harlem Globetrotters and later owned a successful public relations and marketing firm. Jesse Owens was inducted into the Alabama Sports Hall of Fame in 1970. Awarded the Presidential Medal of Freedom by Gerald Ford in 1976, Owens died of cancer in Phoenix, Arizona on March 31, 1980. He was buried in Chicago, Illinois. In 1988, Owens’ wife of 48 years, Ruth, was presented the Congressional Gold Medal on his behalf by President George Bush. 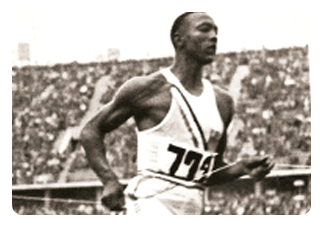 And in 1996, sixty years after his triumph at the Berlin games, citizens in Owens’ hometown of Oakville dedicated Jesse Owens Memorial Park and Museum in his honor.